colinmoore had the most liked content! Anything mechanical,DIY, Garden. Retired now so anything to avoid daytime TV! What type of pump is it, most electric pumps I have fitted tend to be better at pushing fuel, rather than sucking, so I usually fit them near to the tank. Yes with the throttle wide open cars behind you would turn on their headlights to be seen. Hopefully with modern semi synthetic two stroke oil at a leaner mix it will run more cleanly. I haven't run it in anger yet, waiting for some warmer weather. My latest project was the result of a nasty attack of nostalgia, I wonder if any of you older guys remember this classic (some say) bike of the early 60's. It was a 250cc 2 stroke which was the largest bike you could ride on "L" plates, just happens to be my introduction to motorcycling. An ebay buy, which has now had a total restoration by me. I bought some similar gauges via america as they were cheaper than many outlets over here, and they work fine with sensors supplied. But beware, I had to pay import duty on them, which was around £18,if I remember correctly, so take this into account. I too tried the accuspark dizzy and stealth black box, never got it to run properly, so I ditched the module, and ran the accu dizzy with modified spring set up. With 10-14 degrees static advance. this ran much better in my 2.0 pinto. I personally prefer the look of my kit with a spare wheel, it also adds some protection from rear end impacts, by spreading the load. Remember the fuel tank is just behind it! Q Plate Mot After 1 Year? MOT after first 12 months on my Q plate. Yes I read an article on how to spot a fake, I thought this pump had all the credentials, but it's not easy to spot a fake. I'll probably put this replacement on the bay, for somebody else to take a chance. How about a Duratec engine ha ha. So I have a 2B running a 2.0 Duratec, with a swirl pot in the boot that is supplied by a Facet silvertop pump on the ingnition on circuit. The HP pump is a cheapie from ebay (£30), well I am a pensoner. Anyway as the HP pump is a bit of a screamer, only heard at idle, I thought I would upgrade to a proper Bosch 044 pump. This was sorced though ebay from Austrailia, and claimed to be the genuine article, it has the correct hologram, and the helicoil on the inlet, so seemed to be the real deal. Coming from this seller was at about half price delivered to what we can buy over here, so after a wait it arrived and was fitted. Still not that quiet, but better than the cheapie, after about 500 miles I was stranded at the roadside with no fuel pressure and a blown 15 amp supply fuse to the HP pump. A Hoodie bodge (a direct feed from the battery) gave no movement from the pump, so a quick call home had my wife winging her way to me with the cheapie pump from the garage. Luckily it was close to home and within my wifes comfort zone, after fitting, I was up and running again. On checking the Bosch pump later, a resistance check accross the terminals showed only 0.3 Ohms, almost a dead short. Now to my dilemma, the pump is being returned to Australia (£25) for a warrenty replacement, so do I trust this genuine replacement, or continue to use the cheapie screamer? The standard sierra cable is on the short side and requires to be run between the centre of the exhaust manifold, which is then subject to excessive heat. The 2 WD cosworth cable is long enough to go around the front of the engine and avoid the heat build up. Neither of these cables have adjusters to my knowledge, and are the correct length for the automatic adjustment of the sierra peddle box. Tuner Studio MS is what I use for micro squirt, which has a basic free download. You can buy a full version, but I don't think you will need it for megajolt. Make sure there are no air leaks into the exhaust before the lamda, as this will give a false weak mixture to the sensor, which in turn will keep enriching the fuel duration. I had this recently leading to a over rich misfire. 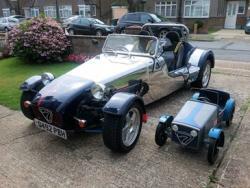 Emissions Proposals For Kit Cars Scrapped! What do you mean Richy, stop talking about it, and get going!